This mural took 25 days to create. hand-painted in a little girl's bedroom, with woodland animals from Bambi, and the Seven Dwarves woodland cottage. 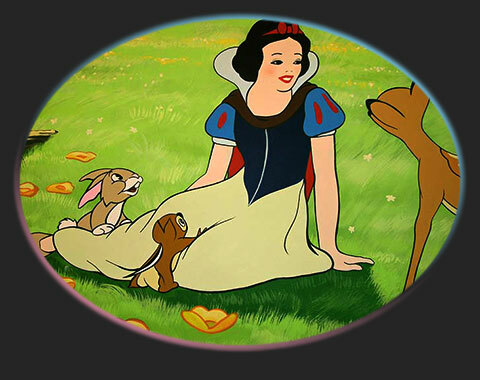 Snow White murals add beauty, charm and imagination to your little girl's room. New! Click the image above to open a large version of this image, which can be zoomed in and out of in your browser. Dopey on Sneezy's shoulders, dancing Russian style! The Seven 7 Dwarves having fun (except Grumpy) in one of my favourite murals. New! Click here to open a large version of this image, which can be zoomed in and out of in your browser. deer in the background chewing on some grass, with birds on his antlers.